Best gaming PC – desktop under 1000 dollars, and where to buy it? Computer games are not as challenging and difficult to play as they once were, but they’re still one of the most demanding „programs“ your PC will run, starting with the CPU and the graphics card as the most important components.Some games require good PC’s, and some much better PC’s. An inexpensive desktop or laptop still has little chance of running the latest-and-greatest, PC gamers have to ask themselves; how much can I, and should I, spend? Best gaming PC under 1000 dollars and where to buy it? Let’s see. For many the $1000 is a PC budget limit. Computers under this are generally considered affordable, even “mainstream,” while those exceeding it are looked at as luxurious items. The average selling price for a PC has meandered between $500 and $600 for the last couple of years, so even $1000 is a stretch for most buyers. But can you really buy decent gaming PC for less than a grand? If you want maximum gaming performance for your budget, a desktop is the way to go. Desktops have always been a gamers choice and always will be for as long as desktops exist as a category. Gamers will also be happy to know that there are a lot of options with discrete graphics cards for less than $1,000. So what will your money buy you? The Acer Predator G3 is a good example of best gaming PC under 1000 dollars. A basic version of this system, with an Nvidia GT 640 video card and Core i7-4770, can be had for $829.99. A system like this can generally be expected to play modern games at 1080p, though only at medium detail, and some very demanding games (like Civilization V and Metro: Last Light) probably won’t hit 60 frames-per-second. Other choices include the ASUS M51, Dell XPS 8700 and Alienware X51. There’s no question that a reasonably capable gaming desktop can be yours for less than a grand, but we also should ask if spending a bit more results in even better value. The answer seems to depend on how much control you have over the build. Acer offers a better G3, for example, with a GTX 660 graphics card. But it also loads up on 32GB of RAM and more storage, upgrades that are unnecessary. As a result,the high-end G3 sells for around $1,400, which is still a good overall value, but way over budget. Alienware’s X51, on the other hand, can be upgraded from an Nvidia GTX 645 to a GTX 670 without altering other components, so the price leaps by $350 for a total of $1,199. That’s a better deal because you only pay for upgrades that really matter. While you can’t buy a desktop that guarantees 60 FPS at maximum detail in every game, you can play every game on the market with a $1,000 rig. Going beyond that price point will improve the performance and allow for more visual detail. In the desktop market, spending around a grand is almost guaranteed to buy a system with some form of discrete video card. Notebooks are a different story. Many systems sell for well over $1,000 with only Intel integrated graphics, so finding an affordable option with gaming potential is difficult. Well then, I think there isn’t the best gaming PC under 1000 dollars, but there are a lot of good ones. While there are various caveats, pitfalls and exceptions, the general answer to this article question is a solid yes. You can buy a good gaming PC for less than $1,000 and expect it to run all modern games at 60 FPS, though you’ll sometimes have to dial detail back to medium – unless you build your own desktop. 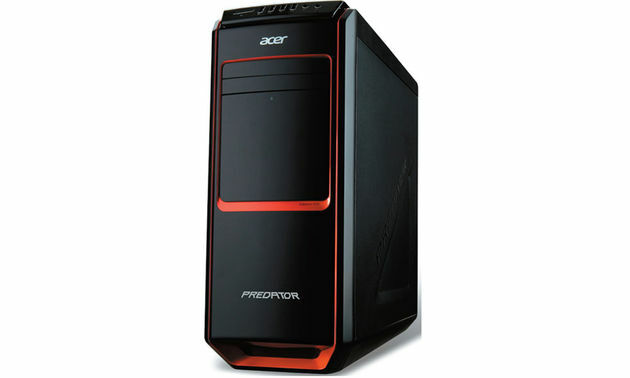 We would like to recommend Acer Predator G3 as the best gaming PC under 1000 dollars. Because with this PC you will be able to play almost every game and it is affordable to you. Here are some stats why we consider Predator G3 as the best gaming desktop under 1000! Click here to read our article about BEST CHEAP GAMING LAPTOP! Summary : The Predator G Series is geared for extreme gaming. The belligerent black and orange colors show it's ready to rage. And so are you, armed with the brawn of 4th Generation Intel® Core™ i7 processor, 12GB of DDR3 Memory, and frame-dominating discrete graphics.